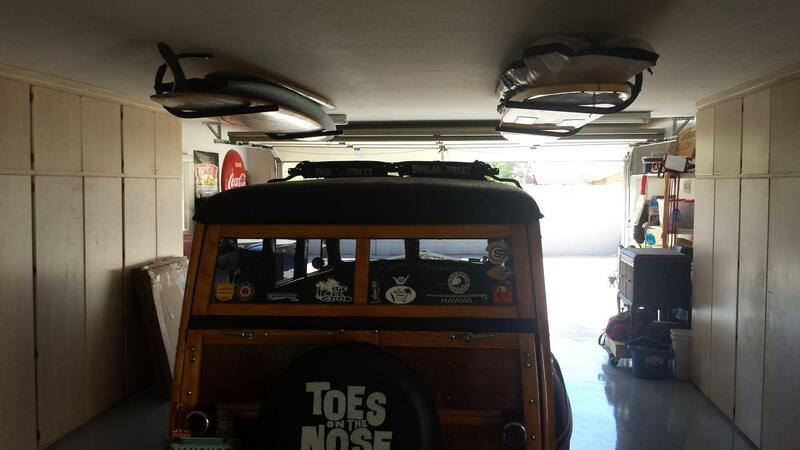 Overhead surfboard storage - utilize that empty space! The Surfboard Ceiling Rack is a great space saver for your home, garage, or office. This ceiling rack is a simple design that allows you to store your sticks overhead rather than tripping over them. These racks provide very easy access to your surfboard so it is always ready when you are. The bend of the rack is just slightly past horizontal and will ensure your precious stick will not come falling down. Forget the straps and cables of other racks and get this simple yet effective ceiling rack. Hi! I’m Andrew from StoreYourBoard.com. 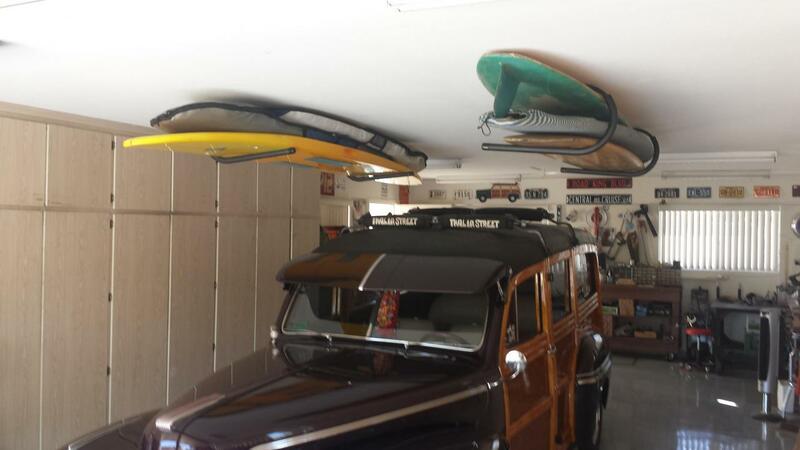 I’ve got a great overhead surfboard ceiling storage solution for you. If you’re looking for a great way to get your surfboard up and stored, check out this rack. The rack itself comes with two arms that you’ll mount to your ceiling, two quick screws into your ceiling. You’ll set up the distance that you need to accommodate your length surfboard. We got an 8-foot board in here. It’s about 22.5" inches wide, and so there are some relevant dimensions on the rack to fit in what surfboards you have, so the rack will look like this. It’s pretty basic, rigid steel rack, padded with foam to protect your surfboard while it’s stored. It’s width is 27 inches, which we recommend to surfboards that are wider than 27 inches. It shouldn’t be a problem for accommodating almost all types of surfboards. The thickness then is 10 inches thick, so again unless you have a thicker than 10-inch board, you’re going to be fine and really I’ll show you how you can have two surfboards stacked on one another if that’s how you want to use this rack. The weight limit is 50 pounds, so two surfboards together should be under that. Just watch if you’re trying to store something like a really heavy lot or something up like that. Then you mount it to the ceiling. Pretty simply as I mentioned, two screws into the ceiling into your ceiling joists, and then it will look like this. You have your surfboard stored. You will be able to get it right down the rack like that. Obviously if your ceiling is taller, you’ll be on a ladder, maybe you’ll have to bend, pass your surfboard down to another person. Then this is the ceiling rack up on the ceiling. Very simple as I mentioned, simple to take in and out for your surfboard. We’ve got to place back up in the rack now, flat to the back of the rack so that it sits right in there. One another great feature about this rack is that once you mount it to the wall to the ceiling like this, it’s angled up slightly so that’s going to keep your surfboard in securely. If there’s a little downward weight applied to the rack, it’s not going to hang open and let your surfboard fall right out. We got a second surfboard. Of course, this one doesn’t have fins in it. If you have fins, maybe you can face it upwards depending on the size of your fins but it will allow you to fit a second surfboard like that. You’ve got two surfboards, probably no problem depending on thicker longboard, you might be looking at the potential thickness, again 10 inches. It’s a really great rack. 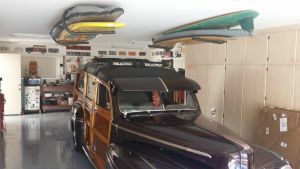 It works well in getting your surfboards up and out of the way to store in your garage, somewhere inside your house to create some extra room for your home. Check it out on StoreYourBoard.com. Can this rack also be used for a wall and not the ceiling? Yes definitely, see the image below. 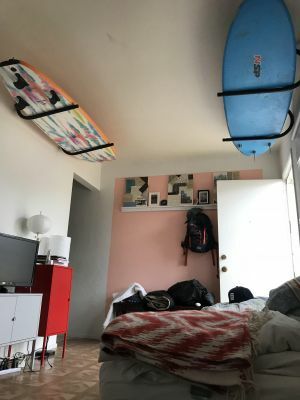 How big of a Surfboard can this ceiling rack hold? We recommend using it for surfboards that are 36 inches or less in width. This should pretty much accommodate any surfboard. The rack arm extends about 20 inches and it is no problem to extend out over that, you just want to make sure the center a gravity is still well within the rack and it doesn't easily tip out. The fact that this rack is bent up on a 10 degree angle past horizontal helps to keep your paddle board in the rack. 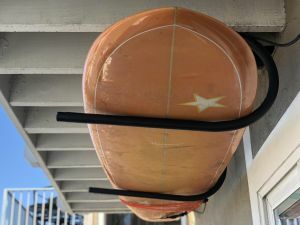 As for width, this rack has 10 inches of vertical clearance which should all surfboards and provide ample clearance to stack up a couple of your favorite surfboards. Just make sure the rack is securely mounted to the ceiling joists. 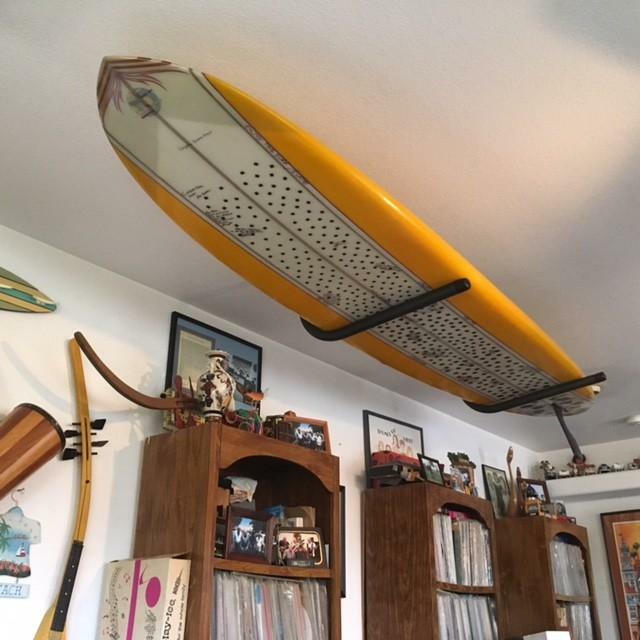 For the length, this surfboard ceiling rack comes in two parts that can be mounted independently. With this it can pretty much accommodate surfboards of any length. What is the dimension of the storage space from ceiling to rack? 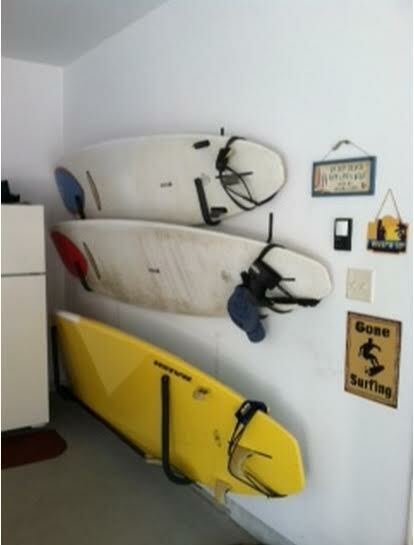 I would like to store two surfboards as shown...and an additional item. Will this hold an 11'4" Nash sup board? 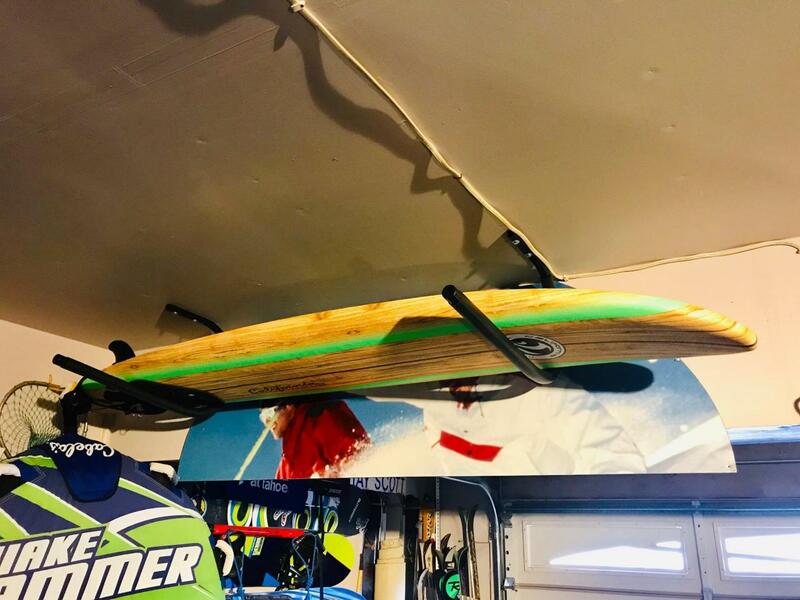 The ceiling rack as it can hold most SUPs up to 36" wide and up to 50 lbs - we list it here with more specifications for Stand Up Paddle Boards. If your Nash is wider than 36" this won't work, and you might want to check how thick it is as well, as the gap where the hooks hold the board is 10", so as long as the rails/thickness at both ends of your board are less then 10" that part should be fine. As for the length -- that shouldn't be a problem itself, because the rack consists of two arms that you can place at whatever distance you need to support the length of your board. Can you use this rack for a foam board or just fiberglass? Can it be placedon the wall? I worry about indents in the foam. Our ceiling rack is foam padded to protect a board; for a foam surfboard, with this rack set up as a ceiling rack, you should be okay using it without indents. And, yes, you can set it up as a wall rack, we have a picture of that on this listing. I think for a foam board it might work better as a ceiling rack though. An alternative wall rack is this one, seen here, which is also padded for some protection, and you can set the arms either at a slight angle or almost horizontal, and storing horizontally might be a good option for your board. Is the price for one bar or for two? 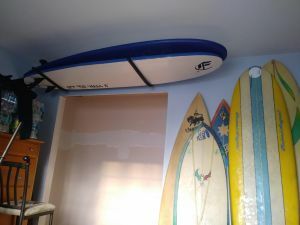 Our ceiling rack is sold as a complete set of two arms to hold your surfboard! So if you just need to store one board, then you just order the one rack, and you will be set! It also includes includes mounting hardware. I have two 9' longboards and a 6'2" short board. Will one set at least be able to fit the two longboards or possibly all three? 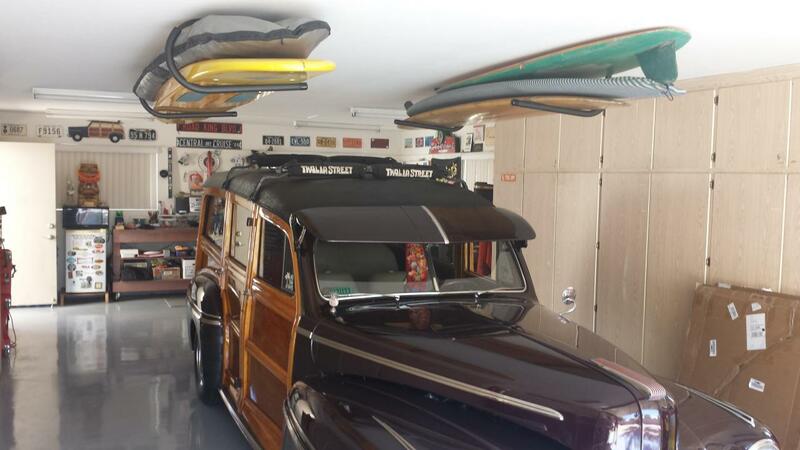 This ceiling rack can store a couple of surfboards. You have about 10 inches total of space where your boards sit, so that is a factor to look at, how thick your boards are combined. Also, while strong and able to hold a couple of boards, the more you put on it, it may bend down a little -- it will really depend on the weight of your boards as another factor, after how thick they are combined. The length of your boards doesn't matter so much, because you can space the arms out as far or close as you need to accommodate their lengths. You are probably good with at two of the boards on this, 3 might be pushing it. How does this attach to the ceiling and do the boards hang flat? Can this be used for outdoor storage as well? I'm worried about it rusting out. 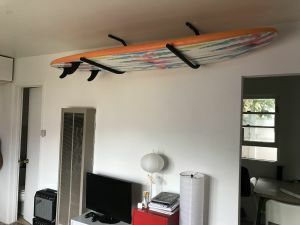 This ceiling surfboard rack is *not* recommended for use outdoors. Its not stainless steel, and the foam on it could wear out as well as it having potential rust issues if used outdoors. Here you can find our collection of surfboard racks recommended for use outdoors, sorted out by whether they are intended for use in freshwater or saltwater areas - outdoor surfboard board racks. I used the rack for verticle storage of my two SUPs. I attached the racks to the side of my boat dock and it works great. Fits great in the garage and super easy install will a cordless drill. Room for a second board! The racks were easily installed per the instructions and created much needed floor space for me in an overcrowded garage. Each rack easily holds two surfboards. The racks are well constructed the only small criticism is that the plastic end caps for the rails do not fit tightly and are prone to falling out. I'm very happy with this rack. I tried another system that didn't work, but this rack is perfect. Needed a place in the garage for my son-in-law's boards (he visits from Redlands), and this one fit the bill. The package arrived missing the mounting hardware, but Justin rushed out a replacement for me, and kept in contact the whole way to make sure I was satisfied. Awesome! StoreYourBoard.com was a pleasure to do business with! End caps on one piece fall out ;otherwise product looks good. The brackets worked perfectly, I attached them to a couple of 4x4 posts I put in down by the water and they look great a fucton perfectly. This product is very easy to install. We didn't have a stud exactly where we wanted so we just used some toggles we had laying around and boom done in 5 minutes! If you have a stud where you want it it's even easier, just screw into the stud and done! Very very sturdy and good quality items went into this rack. Pretty stoked on my decision for these in our chill room with all of my boards, had to get a ceiling rack for my bigger boards that wouldn't fit standing. Other than missing washers and the black plug for the end of the board support, all else worked out fine. Happy with the Hi-Port 1 Storage Mount. Easy to install, board hanging from the garage ceiling.... 8'6" board. Quality nof product is great! Highly recommend. Good sturdy product. Well engineered. Easy to install and great quality. Love it. Best thing about this company is the customer service. The best. Wouldn't hesitate buying anything from StoreYourBoard. great product quick shipping excellent customer service! Just being married and bringing 2 households into 1, we need storage space. I didn't want my husband to just leave his boards outside. These are perfect for our storage unit out back. Easy to install and very practical. He was thrilled with them. Mounts easily, nice and sturdy. Perfect for the space above a door. 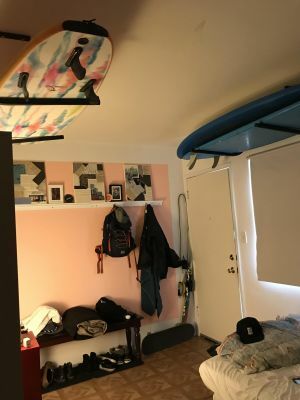 I live in a small studio apartment close to Pacific Beach SD. After browsing the site I found what I needed. I ordered 2 sets of ceiling racks and they came within the delivery window. 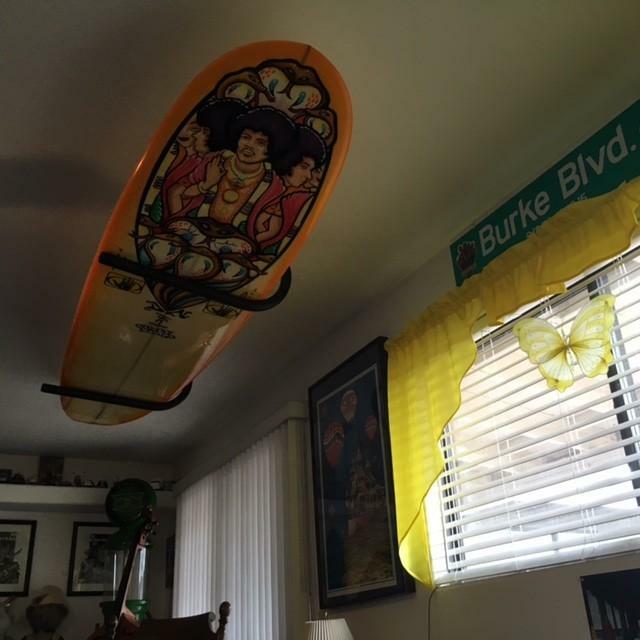 Easy to install and adds the perfect touch for a surfers home. It looks cool having the boards suspended from the ceiling and clears up so much space. Looked for a storage solution for our two sups. 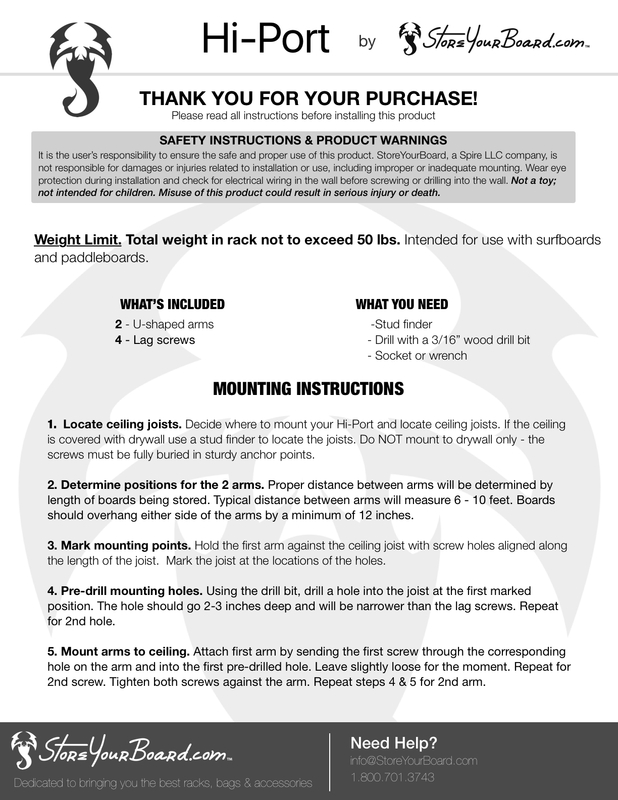 We order two sets of these to hang our boards from the ceiling in our shed and they work perfectly! Great product. I have a 24" wide 9' long longboard surfboard and a 6'10" fish surfboard, and they both fit. Once I found the studs in the ceiling it was an easy install. I bought this rack for a 9'6" longboard that I recently purchased. I live in a small house, and I don't have nine and a half feet of wall anywhere in my home --- but I do have ceiling! This rack is simple, sturdy, non - intrusive, easy to install and cheap. What more could you want? THIS IS A GREAT STORAGE SYSTEM ONE PAIR WILL FIT TWO LONGBOARDS FINE. RACK IS WELL CONSTRUCTED AMPLE FOAM PROTECTION AND HARDWARE IS USABLE. DELIVERY WAS FAST . We ordered these racks for our SUP, however, we didn't install them to the ceiling. We attached them directly to the side of our golf cart frame, so we could carry our board to and from the beach. They are marvelous in this way. They keep the board against the cart without scratching the board. was just what I needed, the surf board Ceiling rack were perfect and were easy to install, if I need anything else, will definitely use your products. the thing does not work right now in my one BR apartment because my wife does not want the board in the wall or the ceiling. The rack is too bulky and unattractive for inside the home, perhaps in a garage. Very easy to install and works great. Less expensive and more effective than making my own racks. I have a 9' board and limited space. This worked perfect. Simple, easy to install and does its job. What more do you want from a rack? Very nice ceiling board rack. Shipping was extremely fast!! Easy to install, and helps tremendously with saving space in the garage. We are happy to say that these are super easy to install and perfect for our SUP boards! We were able to mount two to the top of our garage with ease. Really sturdy and well made! Easy installation. Works perfect for my longboard. Great product. 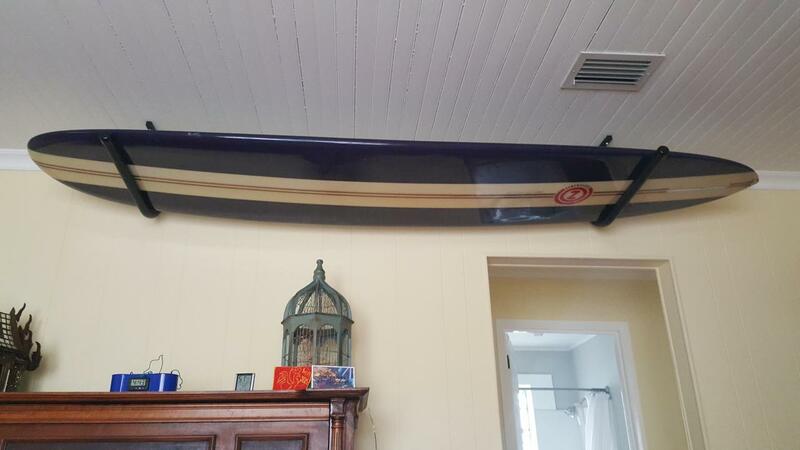 After years of having our yard cluttered with boards and other surfing gear, we put one of these into our son's room. It holds several boards or, in our case, a long board and a wake board. Very light. Nice cushiony racks the board slides onto. Easy to install. Good value. Excellent service, excellent product. Would definitely recommend this company. I have a 9' and a 7'6", and they fit together nicely on this rack. My one critique is that the screws that come with the rack are a little bit weak and will break if you try to screw them into wood without first drilling a pilot hole. Drill an adequate pilot whole or switch them out for stronger screws. I purchased two sets of racks for two of my favorite boards after I got permission from my wife to hang the boards in the den. The racks went up with minimal effort and look great and make the boards look awesome! I really like the side access to allow placing the boards in the racks when there is limited space. I am very happy that I purchased the racks and thank you again for providing such a great product! Written by: Jeffrey todd H.
I should have bought these ( I bought 2) years ago. Easy install, came with lag screws which was nice, installed in 5 minutes. Now i'm ready to purchase their bike rack system. These are really sturdy. I'm using them to store 2 longboards with fins removed. The screws that came with the racks stripped out within 2 seconds of drilling. But the rack looks great and I can fit at least 2 boards! 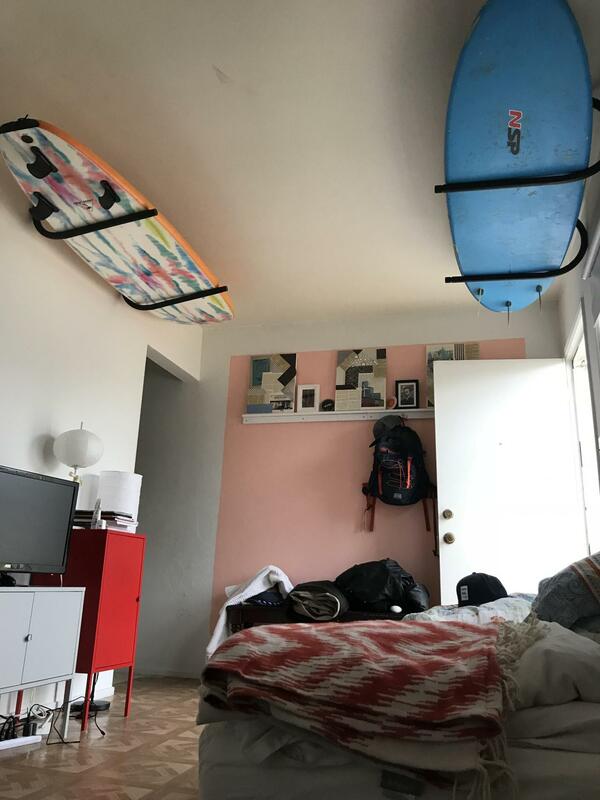 We bought two ceiling racks for 3 surf boards. The racks arrived in great condition and on time. They were really easy to install and are good quality. They've been up and used daily for over 6 weeks now with no issues. Awesome product and great company to work with. I highly suggest this purchase. This is the second set of ceiling racks I purchased. Both work great and store my short and long boards. The rack accomplished what I expected, holding multiple boards. The rack is well made and was easy to install. Worked perfect. Just right for 2 boards with room for other stuff. How long have I wanted to get my husbands board out of the way and in a safer location? Forever. Thanks Storeyourboard! The size was perfect and now keeps my boards out of harms way! I was hoping to get new rack to store my board. The ordering was easy, it came on time and was exactly what I wanted. Easy to install and appears to be built very well. Arrived on time. Good product. Was a little less rigid as I expected, but does the job with a 10 ft long board. Due to how my ceiling joists are arranged, I could only put one screw into a joist and used heavy duty wall anchors for the other mount holes. Room for another board! I have small garage with less than 9 ft ceiling. Board is up and out of way. Only negative is the srews supplied are not good quality. They seem like drywall screws. I would use a deck screw or stainless screw or lag bolt. Would recommend for the price. We've order this surfboard ceiling rack to store a ladder instead of a surfboard. There's really light or no competition for such a product. We highly recommend it. The racks were exactly as described ... fits my longboard with room to spare for another and/or a SUP. Quality is good, racks are strong and don't bend, padding around racks is good. Installation was a breeze. Does the job excellently. I have an angled ceiling with wood beams that meet at the high point center line of the ceiling, these are bolted to the beams. Now my surfboards are more artistically displayed, and now I have more floorspace since the surfboards are no longer standing on the floor. Beautiful. These hooks are fantastic and easy to install! I searched the web for board storage solutions before deciding on this product. Simple, easy to install, it is a great value. Wish I knew about this product years ago. I visited many surf shops over the years and none of them had a Ceiling Rack. I improvised over the years using rope or thick fishing line. Struggling each time putting my surfboards up and down. Now it is very easy. Stupid me for not checking the internet earlier. I could of saved a few hundred dollars in costly ding repairs. Decent Product..easy to install. Holds my longboard and my son's wavestorm no problem. Two boards max on this rack. Good price for the product. This worked out just great for getting my board off of the floor. Customer service was excellent as well after a small hiccup in the confirmation and shipping. Would definitely use these guys for any board storage needs. Thanks a lot! This products was quick and easy to install. 10 minutes and my board was off the floor. Customer service was especially helpful in regards to confirmation and shipping. Thanks guys! Put this up on my ceiling to store both my longboard and shortboard. Super easy rack. i put the longboard on the bottom and the short board on top - keeps both of them out of the way and ding free. wish i would have purchased earlier.